The company needed to guard against cross-contamination of their multiple laboratory settings throughout the facility. 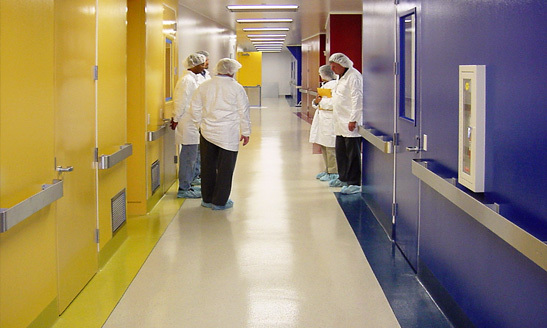 To guard against cross-contamination issues throughout the labs and conjoining corridors, Cornerstone installed a regulatory compliant flooring system, as well as Cornerstone products to protect and cover the walls and ceiling. The Cornerstone installation team was brought in during the laboratory’s building process so the trusted Cornerstone products would be in place from day one. While having to coordinate their installation of both flooring, wall, and ceiling systems with the rest of the facility’s construction, it was crucial to keep a clean and safe work space. The installers prepared the substrate through mechanical preparation utilizing HEPA filtration. All excess dust, curing agents, and contaminants were removed so installation could proceed. A CS5000 Moisture Vapor Transmission suppression system was installed and the substrate was then leveled to ensure even distribution of the flooring system. The walls, and ceiling were also prepped and an application of a monolithic coating of epoxy was spread. After this base level of Cornercrete was set to help guard against cross-contamination and chemical infiltration, the floors throughout the labs were given a base of mortar and several layers of grout and quartz to both protect and add a visual failsafe to the LabFloor® flooring system. The finished Cornerstone LabFloor® not only remedied the clients cross-contamination concerns, but also provided a finished product that guards against deterioration from both natural and chemical agents. The flooring system was extended to both the walls and ceiling to add a layer of monolithic epoxy to help control possible regulatory issues. This wall and flooring system is currently over eight years old and has had no service issues. To subscribe to our e-newsletter, please enter your email address below.